I am sorry there is no crumb shot. We haven’t eaten the buns yet, they are for tomorrow. I am a stickler for tradition. 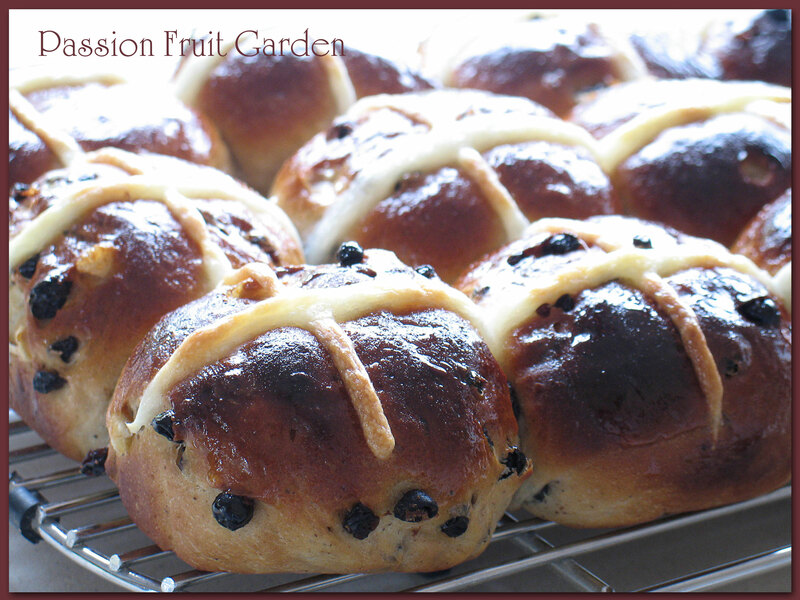 Hot cross buns can only be eaten on Good Friday. This is not on religious grounds (those who know me know I missed out on the religious gene) but as a protest against supermarkets putting hot cross buns on their shelves just after Christmas. This recipe is from Bread by Jeffrey Hamelman. His recipes are primarily in commercial quantities – in US measurements and metric but he also includes quantities for the home baker in US measurements. Usually, I make one tenth of the metric recipe but in this case that would give me 14.4 buns. The home baker quantities makes, a more socially acceptable, 12 buns so I have converted the US measurements into metric. Because of this, the quantities are a bit strange but don’t worry, it works. I have made this recipe using these quantities several times. *This is not Jeffrey Hamelman’s paste but a much simpler version by Susan at Wild Yeast. Sprinkle the yeast on top of the milk, then whisk until combined. Add the flour and the sugar and whisk until smooth. Cover and set aside for 30 – 40 minutes. Put the flour into the bowl of an electric mixer with a dough hook. Add the egg, sugar, allspice and salt and mix until combined. Add the sponge and mix on low for 3 minutes. During this stage you may have to add a wee bit more milk or flour, depending on the consistency of your dough. After the initial three minutes, put the mixer on the second speed and mix for an additional three minutes. The dough should clear the sides of the bowl and come together. Add the currants and peel. Mix on low until evenly distributed. Transfer the dough to a lightly oiled bowl. Cover with plastic wrap and leave for 30 minutes. Do a stretch and fold. Return the dough to the bowl and leave for another 30 minutes. Line a baking tray or, better still, a pan with baking paper (my pan was 33cm x 23cm and it was perfect.) A pan is better as it keeps the buns close together and stops them spreading too much. Weigh the dough and then divide it into 12 even pieces. Lightly knead each piece and form into a ball. Place the balls onto the tray quite close together, cover with plastic wrap and leave for about one hour. When ready, the buns should have expanded and be touching each other. Make the paste for the crosses. Combine all ingredients. You want the paste quite thick (not runny) but not so thick you can’t pipe it. Combine the sugar and water in a small saucepan and bring to a rolling boil. Fill a piping bag with the paste. Pipe the crosses on the buns. Use a nozzle with a round tip and a small (5 mils) opening. Bake in the pre-heated oven for 15 minutes. If the buns start to get too brown, reduce the temperature to 200°C. Take the buns out of the oven and immediately brush with the glaze. Mr Hamelman advises the buns are best eaten fresh but day-old buns can be reheated successfully covered in aluminium foil and heated for about 6 minutes at 180°C. This entry was posted in Bread, Commercial yeast and tagged Jeffrey Hamelman by Glenda. Bookmark the permalink. With a holiday away and some drama with the freezer, I didn’t have one single hot cross bun this year, made or bought. It didn’t even enter my consciousness but I now see a constant stream of recipes in by inbox so I will we well prepared for next year. What a pity Fiona, it is good to have, at least, one. Glenda, that opening photo is exactly like the one in my mind’s eye when I think of hot cross buns. You’re obviously a wonderful baker but are you psychic, too? John, I hope you got to have at least one HC Bun over Easter. Hi Maree, I have tried lots of recipes but I like this one. I bought extra ingredients to make my version of the buns this Easter weekend, but then ran out of time… and belly space! Liz, you will have to pretend next weekend it Hot Cross Bun Weekend. Thought it was only in South Africa where everything Easter is on the shelves just after Christmas! Love a toasted hot cross bun with lashings of cold butter. Have a wonderful day Glenda. Looking delicious as usual. Can you tell me if there is a fair this weekend in Bridgetown? Will you have a stall with your produce? Hoping I haven’t missed it. Love your blog by the way. Love love love your soap. Hi Julie. There is no fair as such. Bridgetown hosts a big tennis tournament over the Easter weekend. I am having a stall at the riverside markets (which is on every fortnight). I decided to have it this weekend as there will be a lot of people in town, for the tournament and because of the break, generally. Do come and introduce yourself. Alternatively, come and visit me anytime. Just send me an email and I will give you my address. Btw. The stall is on Sunday morning. I feel just the same about supermarkets and Hot Cross Buns, which is why we don’t eat ours until Good Friday. Your crosses look good Glenda. I wish I’d read this before I made mine this afternoon as my crosses don’t include oil and they look very wiggly. Hi Anne. The oil must be the trick then. I will remember that. Is your recipe particularly good? It’s just a a basic fruited loaf with a few extra spices.